Home / Epson / Stylus D and DX series / Epson Stylus DX4450 / T071540 – Original Epson Branded Pack of 4 Cartridges Delivered Fast & Free! 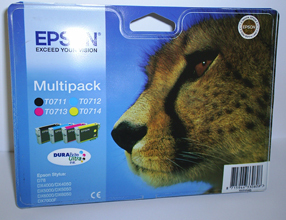 T071540 – Original Epson Branded Pack of 4 Cartridges Delivered Fast & Free! 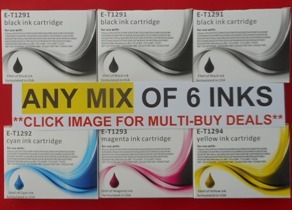 1.T1291BB – Guaranteed BARGAIN BUNDLE of SIX HIGH YIELD Epson “Apple” Compatible Ink Cartridges – delivered FAST & FREE! 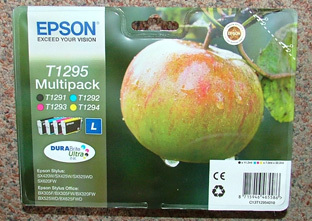 T1295 Apple – Genuine Epson (Apple) Multi-pack of 4 HIGH YIELD DuraBrite ink cartridges – delivered FAST & FREE! 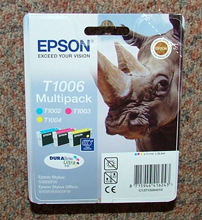 C13T100640 – Genuine Epson Durabrite 3-pack of (Rhino) High Yield Colour Cartridges – delivered FAST & FREE! 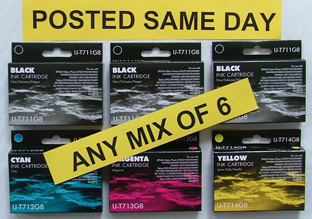 1.T0711BB – BARGAIN BUNDLE of SIX Guaranteed Compatible High Quality Ink Cartridges (3 Black + C/M/Y) – delivered FAST & FREE! T1001BkC – Guaranteed Compatible HIGH YIELD BLACK Cartridge (Rhino Type) – Delivered FAST & FREE! We have traded on the web over 14 years. During this time we have supplied goods to over 25,000 domestic, commercial and school customers - many of whom come back time and time again as their printer(s) need refueling.